BACKBEATS: SOUL SEARCHIN’-FINDING GOLD IN MEMPHIS 1968-1979. During the sixties, Southern Soul was at the height of its popularity. Independent labels like Stax, Goldwax and FAME, and majors like Atlantic released some of Southern Soul’s most commercially successful and critically acclaimed music. However, one label’s success lasted from the late sixties, right through the late seventies. This was Hi Records. Although best known as the label Al Green called home, there were many more hugely talented artist who were signed to Hi Records. This includes Ann Peebles, best known for releasing the definitive version I’m Gonna Tear Your Playhouse Down. In O.V. Wright and Otis Clay, Hi Records had two of the most distinctive and emotive vocalists. Then there’s Syl Johnson, one of not just Hi Records, but Southern Soul’s most underrated vocalists. Still, that’s still just scratching the surface of Hi Records’ bewitching back-catalogue. There’s a whole host of other artists awaiting discovery. Among them are Jean Plum, Donna Rhodes, Bobby McClure and The Duncan SIsters. Quite simply, Hi Records’ back-catalogue is groaning with rich musical pickings that are awaiting discovery. Thankfully, Harmless Records’ Backbeats’ compilation series has just released Backbeats: Soul Searchin’-Finding Gold In Memphis. Released on 20th May 2013, Backbeats: Soul Searchin’-Finding Gold In Memphis features twenty-three tracks from the rich pickings that are, Hi Records’ back-catalogue. Picking just a few of the many highlights isn’t going to be easy, given the quality of Southern Soul on Backbeats: Soul Searchin’-Finding Gold In Memphis 1968-1979. 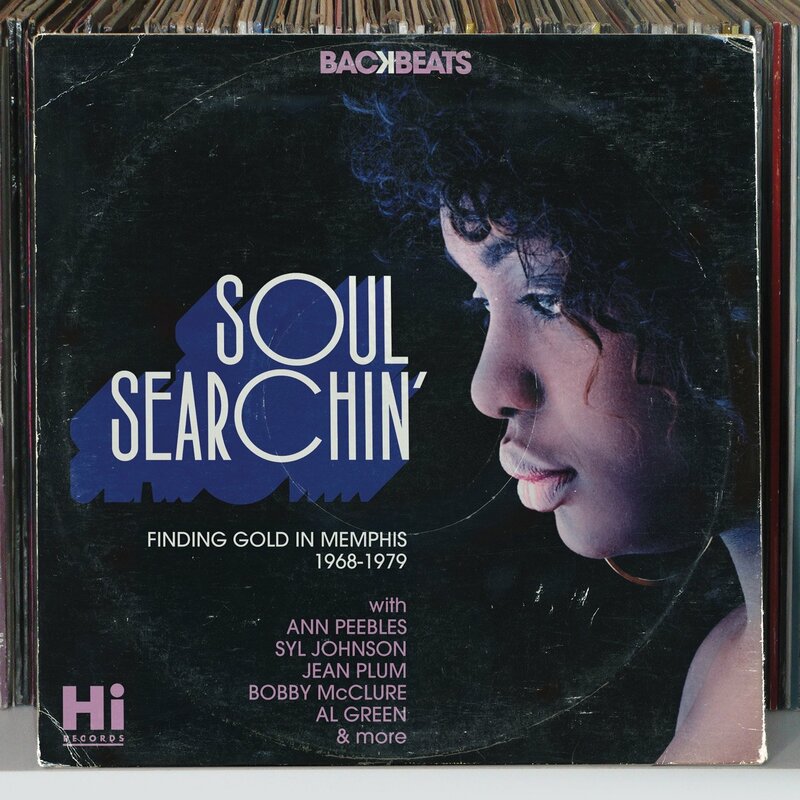 My first choice from Backbeats: Soul Searchin’-Finding Gold In Memphis 1968-1979 is Ann Peebles I Didn’t Take Your Man. This a track from Ann’s final album for Hi Records, 1978s The Handwriting’s On The Wall. By 1978, Hi Records was a very different label from the early seventies. Many of the musicians that created the unique and unmistakable “Hi Sound” had left the label. Gone were the legendary Hi rhythm section, the Memphis Horns and backing vocalists Chalmers, Rhodes and Chalmers. Similarly, musical tastes had changed. Neither Southern Soul, nor Ann Peebles were as commercially successful, withThe Handwriting’s On The Wall failing to chart, A small crumb of comfort was that the Earl Randle and Patricia Barnes penned I Didn’t Take Your Man reached number fifty-five in the US R&B Charts. Here, Ann’s emotive denials prove that she’s still Hi Records’ first Lady. Some of the artists on Backbeats: Soul Searchin’-Finding Gold In Memphis 1968-1979 only played minor parts in the Hi Records’ story. During the five years Quiet Elegance spent at Hi, they released seven singles, but no albums. Mama Said, which was written by Willie Mitchell, was the B-Side to their sophomore single I Need Love. Despite featuring a former Vandella and two former members of The Glories, never enjoyed the success their soulful strains deserved. The same can be said of Eddie McGhee. He only released one single, 1971s hurt-filled Backbeats: Soul Searchin’-Finding Gold In Memphis 1968-1979. Laden with heartbreak, Eddie brings life and meaning to the lyrics. Syl Johnson is one of several artists who feature more than once on Backbeats: Soul Searchin’-Finding Gold In Memphis 1968-1979. Given Syl released four albums for Hi, that’s no surprise. The two tracks are I’m Yours and Mystery Lady, a track from Syl’s final album for Hi, 1979s Uptown Shakedown. Both are good tracks, but I’m Yours is the best. From the opening bars of Syl Johnson’s I’m Yours, it has that unmistakable “Hi Sound.” No other label could’ve released this track. Released as a single in 1973, I’m Yours reached number sixty-eight in the US R&B Charts. This was a track from Syl’s album Back For A Taste of Your Love. I’m Yours features Syl at his best, creating a sultry, sensual slice of Southern Soul. He’s helped no end by backing vocalists Chalmers, Rhodes, Chalmers who feed of Syl. Each drive the other to greater heights of soulfulness and sensuality. The Duncan Sisters’ It’s You That I Need (Part 1) shows how by 1975, Hi as a label was evolving in reaction to changes in musical tastes. There’s a tougher, funky sound to a track that’s designed to light up any dance-floor. This it does, as elements of funk, Southern Soul, disco, drama and rocky guitars are combined. Before becoming one of the best backing singers in the history of Southern Soul, Donna Rhodes embarked upon a solo career. She released her 1969 debut album I See Love on Epic. Then in 1973, having settled into a career as a backing vocalist, often helping make people sound better than they were, Donna briefly returned to her solo career. Where’s Your Love Been was the only single Donna released on Hi. With an arrangement that’s soulful, funky and dramatic, Donna’s breathy subtle vocal grabs your attention. Things get even better when the backing vocals sweep in. Sultry, sassy and incredibly soulful, why Donna Rhodes didn’t enjoy a longer and much more successful career seems strange? Given how important a role Al Green played in Hi Records’ history, it’s fitting that three of his tracks feature on Backbeats: Soul Searchin’-Finding Gold In Memphis 1968-1979. These three tracks are “late period” Al Green. By then, religion had entered Al’s life and made Al question the direction and subject matter of his music. Having enjoyed six number one US R&B albums, four of which were certified gold and one platinum, Al’s success gradually slipped away from 1976s Full Of Fire, which features Al’s emotive and impassioned pleas on Glory Glory. Full Of Fire reached number fifty-nine in the US Billboard 200 and number twelve in the US R&B Charts. Have A Good Time, released later in 1976, featured the joyous and celebratory Happy. It stalled at number ninety-three in the US Billboard 200 and number twelve in the US R&B Charts. Then in 1977, The Belle Album, which featured Loving You, marked the end of an era, with Willie Mitchell no longer producing Al. Absent were the famed Hi rhythm section from an album that was one of Al’s last album’s of secular music. The result was an album that reached number 103 in the US Billboard 200 and number twenty-nine in the US R&B Charts. After The Belle Album, Al’s popularity declined and he was no longer the King of Southern Soul. The King had lost his crown, and Hi Records lost its most successful artist. While Al Green was Hi Records’ best known male singer, O.V. Wright had one of the most distinctive voices on Hi. That throaty rasp is unmistakable. You Gotta Have Love was a track from O.V’s Hi debut album Into Something Can’t Shake Loose. Penned by Willie Mitchell and Earl Randle You Gotta Have Love is the perfect introduction to one of Southern Soul’s most underrated and best kept secrets. As if one contribution from O.V. isn’t good enough, I Found Peace from O.V’s third and final album for Hi, We’re Still Together is included. I’m sure after hearing these two tracks, you’ll be heading to a record shop near you and looking for an album by O.V. Wright. I know that I’ve already picked an Ann Peebles’ track, but so good is If This Is Heaven, that it would be remiss of me if I overlooked it. This was the title-track to her 1977, which Willie Mitchell and Earl Randle cowrote. It’s another track with that unmistakable Hi Sound written all over. From the Hi rhythm section, Memphis Strings and backing vocalists Chalmers, Rhodes, Rhodes, everything is in place for the Queen of Hi Records. She lays down one of her trademark vocals. This she does, with style, passion and power. Emotive, ironic and wistful, in Ann’s hands the lyrics become all these things and more. In the process, Ann creates a late-period Hi Records’ classic. The final track from Backbeats: Soul Searchin’-Finding Gold In Memphis 1968-1979. I’ve chosen is by Jean Plum. Like several other artists, Jean Plum has two tracks on Backbeats: Soul Searchin’-Finding Gold In Memphis 1968-1979, I’m Gonna Stay and Pour On The Loving. These were just two of the singles Jean released after signing to Hi in 1975. One of her best known tracks and most successful was 1977s Pour On The Loving. Quite simply, it’s a quite beautiful track, where Jean and her backing vocalist create a delicious slice of Southern Soul. While I’ve only mentioned some of the tracks on Backbeats: Soul Searchin’-Finding Gold In Memphis 1968-1979, there’s much more music to discover. This includes contributions from James Fry, The Memphians, Bobby McClure, Willie Walker, The Melodics and Majik. For anyone new to Hi Records, then Backbeats: Soul Searchin’-Finding Gold In Memphis 1968-1979 is the compilation to start with. In many ways, Backbeats: Soul Searchin’-Finding Gold In Memphis 1968-1979 is a refreshing, bold and brave compilation. After all, it eschews the predictable tracks that previous Hi Records’ compilations have included. For that, compiler Jaffa should be commended and congratulated. Instead, Jaffa has dug deeper into Hi Records’ back-catalogue. In doing do, Jaffa has unearthed some long-forgotten gems, including Donna Rhodes’ Where’s Your Love Been and The Duncan Sisters’ It’s You That I Need (Part 1). As well as these tracks, there are the contributions from Hi Records’ most successful artists. Of the contributions from some of Hi Records most successful artists, there’s no bigger than Al Green. His name has become synonymous with Hi Records. No wonder, with six number one US R&B albums, four of which were certified gold and one platinum, was Hi Records’ most successful artist. Then there’s Ann Peebles, Syl Johnson, O.V. Wright and Otis Clay. They enjoyed commercial success and critical acclaim, however, not to the extent Al Green enjoyed. Just as “no man is an island,” no artist makes a label a commercial success. Instead, they only play a part in doing so. In the case of Hi Records, it took artists from Al Green, right through to artists who played a walk-on part in Hi Records’ success. Similarly, without producer and songwriter Willie Michell, who masterminded Hi Records rise and rise the label wouldn’t have been as successful. Then there were the Hi rhythm section, the Memphis Horns and backing vocalists Chalmers, Rhodes and Chalmers Hi Records wouldn’t have been the same label. It certainly wouldn’t have produced some of the most memorable and emotive Southern Soul of the seventies. Much of that music was timeless, and forty years later, has stood the test of time. One listen to Backbeats: Soul Searchin’-Finding Gold In Memphis 1968-1979, which was released on by Harmless Records on 20th May 2013 and you too, will agree and will be won over by the Hi Records’ sound. Standout Tracks: Syl Johnson I’m Yours, Donna Rhodes’ Where’s Your Love Been and The Duncan Sisters’ It’s You That I Need (Part 1) and Jean Plum Pour On The Loving.